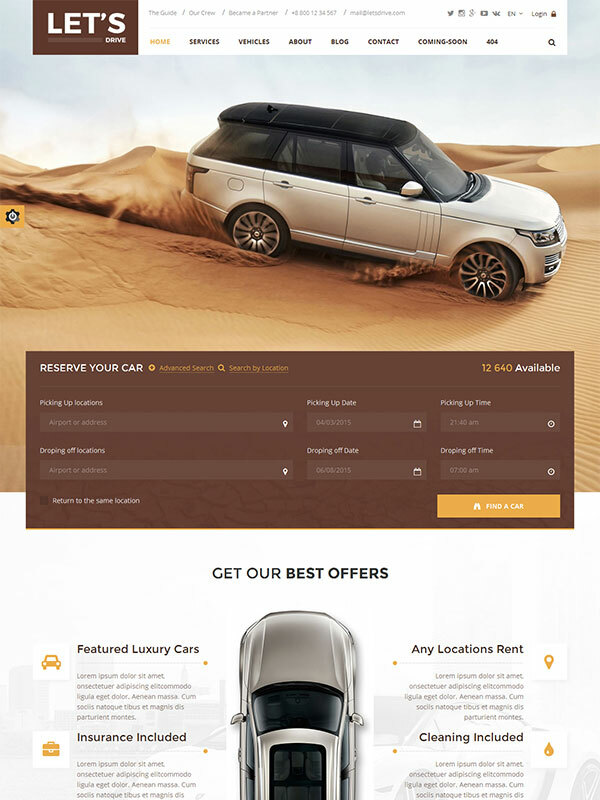 Let's Drive is a responsive HTML5 template that has been designed for car rental and sale websites. However, as the template is versatile, it can be used for other purposes as well. Using the template, you can build websites for renting out cars and other vehicles without making major changes in the template. There are pre-designed pages that will be in sync with the rental business. The template is embellished with an impressive feature-set and is responsive to help you cater the mobile audience. Powered by Bootstrap, you can be sure of the quality and performance of the template. Features such as Revolution slider, Angular JS, and Font Awesome make this template even more effective. The Template is equipped with unique homepage layouts that can be used for the website to cater the niche audience in the most distinct manner. The users get diverse options of layouts to choose from. Let's Drive HTML5 template has Revolution Slider among one of its striking design features. There is an easy-to-use interface that can be used to create new sliders and banners for the website. The template is designed to be retina ready which ensures that our template is delightful to view on high definition retina displays. The devices of new generation provide a visual treat with the template. The template is enriched with Font Awesome that gives the users a freedom to choose from a vast range of fonts for the website and make it stand out from the crowd and impress your users with style. Responsive design is indispensable for the websites and Let's Drive Template understands this better than others. We make use of BootStrap 3.0 to ensure that we are able to create a truly responsive layout with the least effort. Each and every contact form that is on the website is JS validated to make sure that the data that comes from the users are in the most accurate form. This helps in better interaction with the clients and faster resolution of queries. theem’on has a vast amount of experience and expertise in building HTML5 website templates and similar to each one of its HTML templates, Let’s Drive template is also crafted with perfection. Optimized and Validated HTML5 and CSS code for better performance. Let's Drive template offers tested A+ grade speed. We are able to achieve such performance because of the implementation of the advanced technologies like BootStrap 3, optimized and validated code. The template boasts semantic coding which makes the website capable of ranking high on the search engines. We make use of the optimized images as well as quality code for good SEO. We provide blog pages along with the template as we understand the importance of the blogs in marketing and SEO. Through these pre-designed blog pages, we attempt to reduce your efforts. 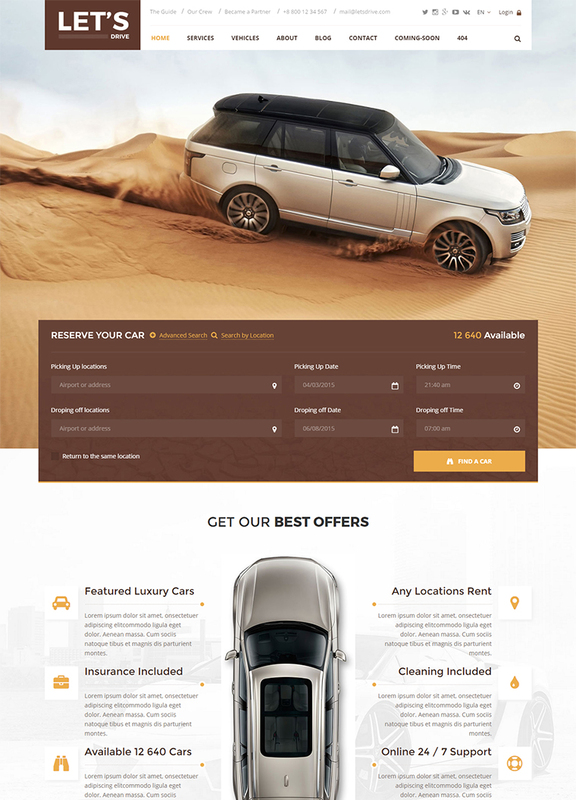 Giving your website a unique and vivid look becomes easier with Let's Drive HTML template. There is a vast range of color and font options that can be used in the website and embellish it. Along with the customization features, we have also added the Google Map API using which you can mark your establishments on the map so that the customers can locate theme easily. If you come across any issue with the installation or customization of the template, our prompt support team of expert professionals will look into the query and offer a resolution at the earliest.